April is a pretty special month. The snow is finally starting to melt and we get to enjoy the nice spring weather. But there’s another reason why I’m glad it’s April. Can you guess what it is? I won’t leave you hanging – April is home to National Grilled Cheese Day on April 12th! Why settle for just one day though? Let’s celebrate this delicious holiday all month long. What do you think? I remember my mom making grilled cheese sandwiches and serving them with a bowl of tomato soup. It’s a classic meal that brings back so many fond memories of my childhood. Fast forward to today and I’m making that same comforting meal for my own family. Grilled cheese sandwiches are a common request from my two daughters. 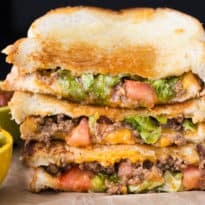 For National Grilled Cheese Day, I’ve partnered with Dempster’s to come up with a grilled cheese sandwich with a twist. 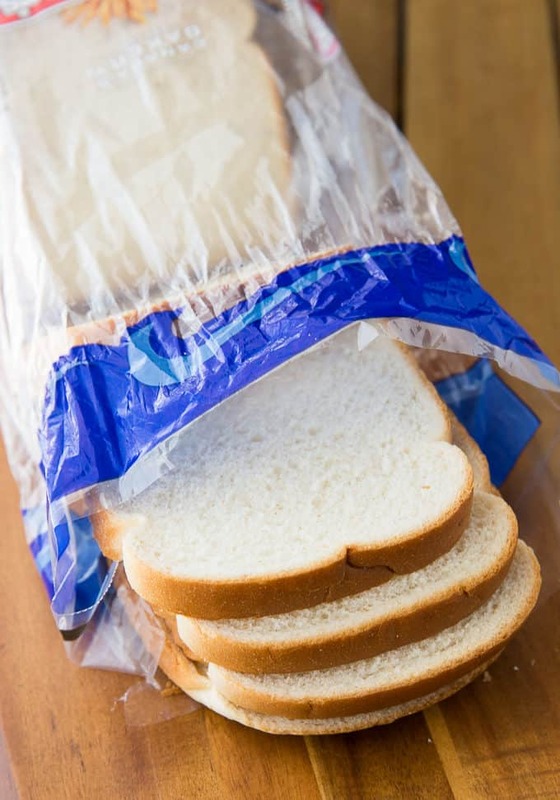 We all know that a great sandwich starts with the right bread and Dempster’s has a fantastic product line for all your sandwich recipes. I choose a classic – Dempster’s White Bread to create my new and improved grilled cheese sandwich. 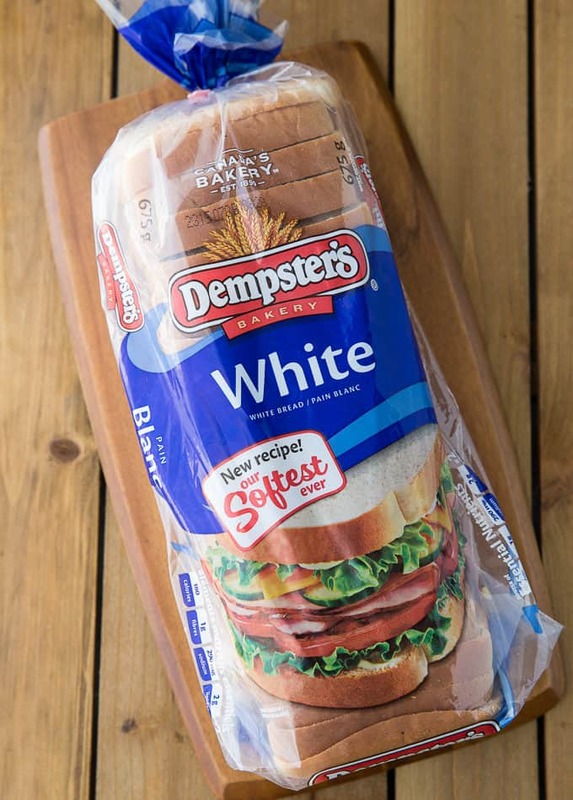 Grab a loaf of Dempster’s White Bread from your pantry and let’s go on a little foodie adventure. It’s a #breadventure! I’m no stranger to creating fun twists on classic recipes. I do it all the time at home to keep things interesting. 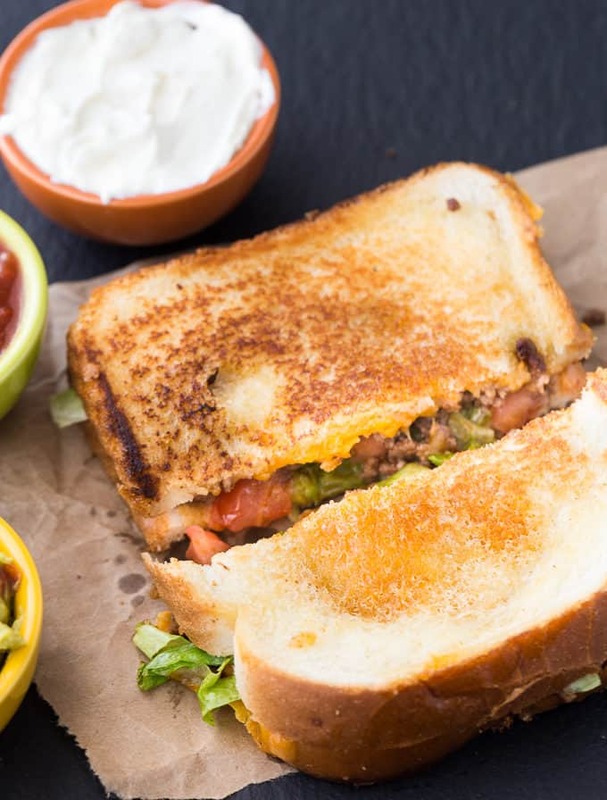 Add a little adventure to your family’s meals with this delicious Taco Grilled Cheese Sandwich. 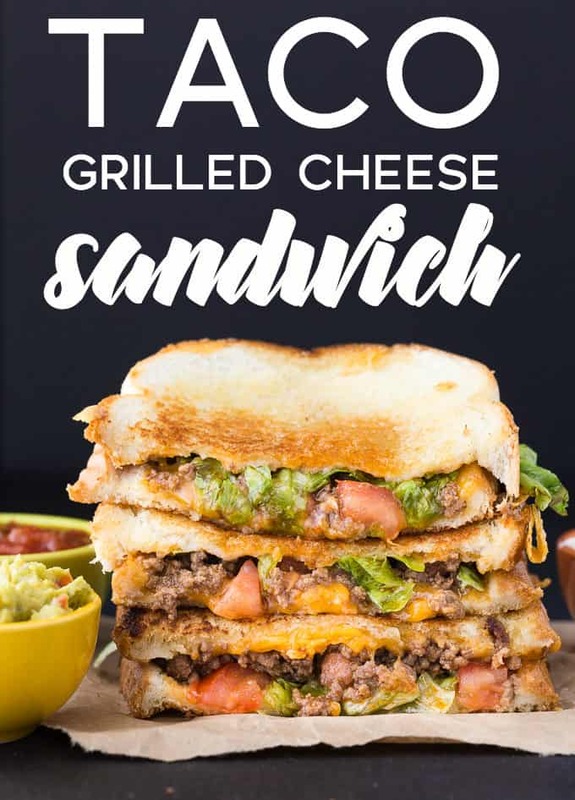 Yes, I’m taking everything I love about tacos and combining it into a classic grilled cheese. And you know what? It totally works! The beauty of this recipe is its versatility. Use your favourite taco toppings in your sandwich. I used the classic taco ingredients like seasoned ground beef, tomatoes, lettuce and of course, a lot of cheddar cheese. Trust me, you won’t miss the taco shell because the grilled buttery bread tastes even better! Don’t forget the dipping sauces. Dunk your sandwiches in sour cream, guacamole and salsa. I like to do a triple dunk and get all three in each bite. No double dipping as my daughter says! One little cooking tip that I picked up in my travels is to soften the butter first before you try and spread it. Put it in the microwave for about 5 to 7 seconds before spreading it on the bread. You’ll find it will go on much smoother and easier. 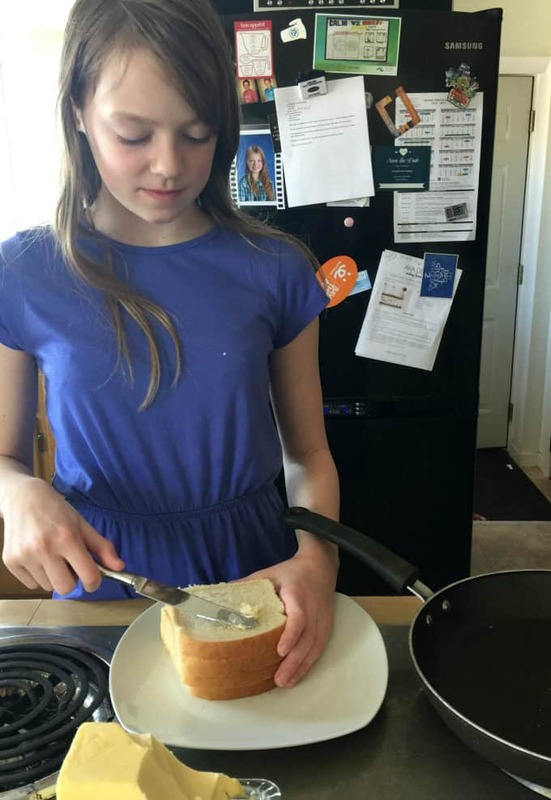 I think it’s an important life skill to learn how to make a proper grilled cheese sandwich so I had my daughter, Bridget, assist me with this recipe. She buttered the bread and helped me stir the ground beef while it cooked. Her favourite part was flipping the grilled cheese in the pan and not letting all the toppings fall out! We had a couple fails at first, but after a few tries she was an old pro! Getting in the kitchen with your kids is an adventure on its own and there is always lots of laughs. I think we’ll be seeing Taco Grilled Cheese Sandwiches on our menu quite often. My family gobbled them up and asked for more. You could also serve them on “Taco Tuesday” to keep things fresh and new. I encourage you to have a #breadventure with your family and try your own twist on a classic grilled cheese sandwich. 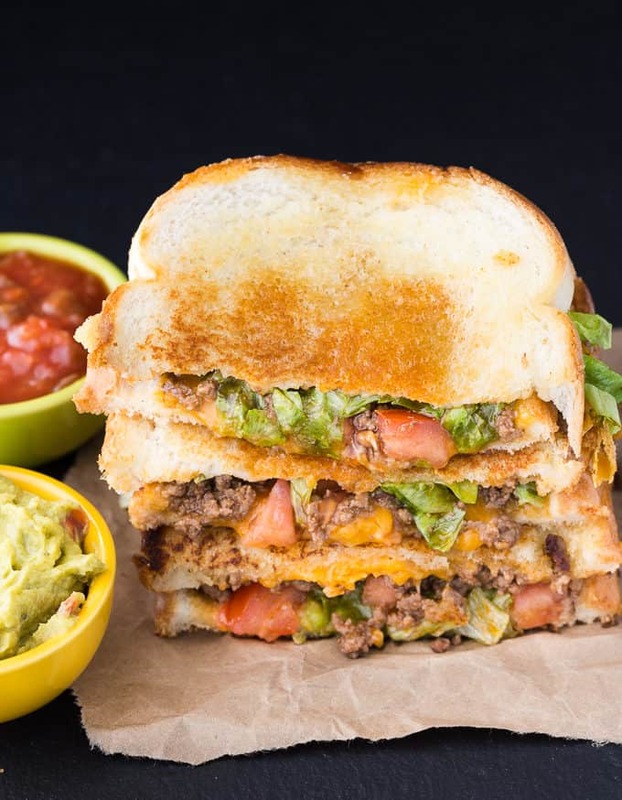 Try my Taco Grilled Cheese Sandwich or come up with something totally different! Before you go shopping for your ingredients, get some Dempster’s coupons to save money on your purchase! You might also like my Jalapeno Popper Grilled Cheese. Celebrate National Grilled Cheese Day by taking two recipe favourites and combining them into one mouthwatering sandwich! So easy. So good. In a large skillet, brown ground beef over medium high heat. Add in taco seasoning and stir to combine. Remove from heat. 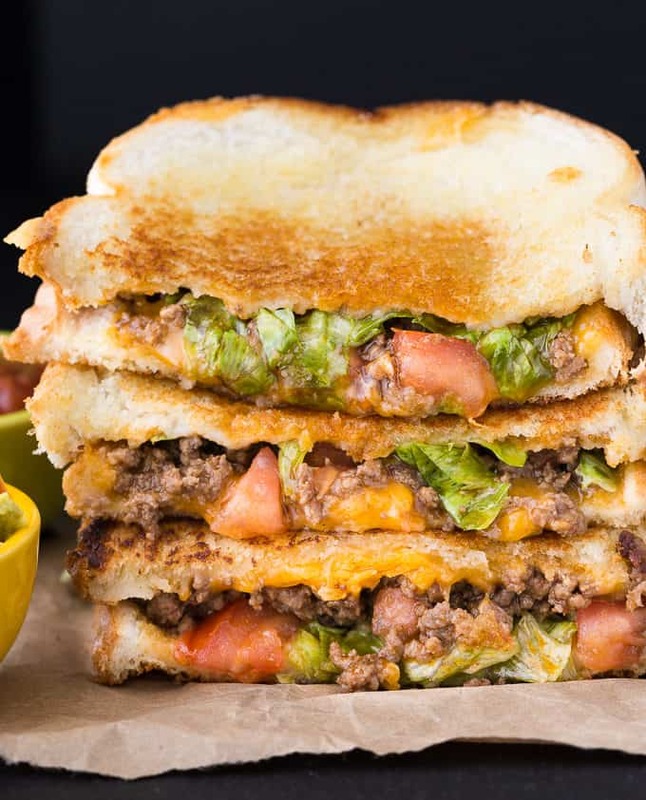 On the non-buttered side, add lettuce, tomatoes, ground beef and cheese and cover with other slice of buttered bread. The buttered side should be facing outwards. Heat a skillet to medium-high heat. Grill each side for 2 to 3 minutes or until desired doneness is reached. Cut in half and enjoy hot. Serve with salsa, guacamole and sour cream for dipping. What’s on your menu for National Grilled Cheese Day? Connect with Dempster’s on Facebook, Instagram, Twitter and YouTube. My son just a regular plain one , I love mine as a nacho grilled cheese . I love to put mushrooms and onions in mine! As a kid I loved grilled cheese with tomato soup when would go to my grandmas! mmm grilled cheese with a blend of 3 cheeses and avocado for me please! Oh my goodness – my husband will love this! I am going to have to try this SOON! OMG! Everyone knows not to scroll on an empty stomach! This is what leads to me scurrying around the grocery store in the middle of the night looking for ingredients! THIS looks delicious! Honestly, you had me from taco. Definitely saving to drool over later. I’m always up for more delicious ways to enjoy tacos! What a fantastic idea! Thanks for sharing your amazing recipe with us at Merry Monday this week! What a great flavor for a Grilled Cheese, yum! Hope you are having a great day and thanks so much for sharing your post with us at Full Plate Thursday. I never thought of making tacos into a sandwich, it looks delicious! Thanks for joining the Creative K Kids’ Tasty Tuesday last week, if you haven’t already don’t forget to link up this week! This sandwich is amazing! Such a great idea, and my family will love this! Thank you for sharing at Celebrate It! Ive made these using pizza ingredients, kids loved them…my youngest daughters name is Bridget too (shes 23 yrs old tho), great name!!! Yum! Love that this is a combination of two of my favourite foods. I’m going to have to try this out.